Is your kid uncomfortable with sleeping in the dark? If so, then it’s probably time for you to get a suitable night light. A nightlight is essential to make your baby’s bedtime fun and easy. As a caring parent, we hope you know this better, and probably you’re wondering about the best product for your child, including the best night light. If this sounds like you, don’t be worried. We’ve searched, tested a lot and finally identified ten best nightlight for toddler & also for the kid. Read on and discover the best one for your precise little angel. Are you on the hurry? For saving your valuable time, we’ve added here a quick table chart. Hope, it’ll give you a quick idea to make a smart choice. Listed below are different types of the nightlight and their incredible features. In our review, we’ve discussed the positive aspects of each model. However, we didn’t forget to mention here the negative issues, too. If you’re in search of a nightlight to make your child’s night-time a lot more fun and less scary, Pediatricians recommended Cloud b Turtle Twilight Plush Nightlight Projector is a perfect fit for you. 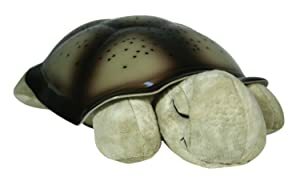 Can you imagine how delighted your little angel will be to know that there’s a sleeping turtle beside her/ him at night? The kid-friendly design and the softness makes it cuddly at night! For a child who has restless sleeping issues, it’s a soothing and relaxing way to make them fall asleep. It gives them something to put their attention on which isn’t too stimulating or “scary”. 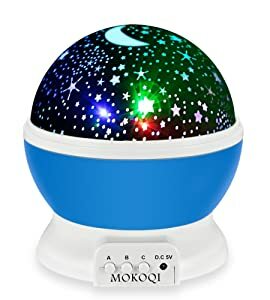 This interactive and educational device can project eight magical constellations of three different star colors on the wall and ceiling that make their bedtime fun and help comfort to sleep. Moreover, the nightlight automatically turns off after 45 minutes. That means, no worry about turning it off! 3 different colors of light (green, blue and amber). No option to keep the light on all night. Looking for changing your child’s view about bedtime with an interactive device? Boon GLO is the nightlight you’re looking for. It’s one of the most favorite night light among children. Children have great fun with its portable Glo balls. 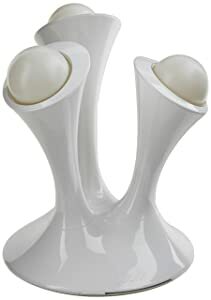 The three removable balls stay glowing about 30 minutes after removing from its base. The Boon GLO Nightlight comes with a stylish looking LED base. Although 9volt power adapter powers the base, the balls themselves don’t require charging or batteries. So, the balls won’t get warm. What’s more, it’s high-quality, BPS- Phthalate- and PVC-free construction not only make the device child safe but also durable. Are you tired of searching a nightlight that is designed for all sorts of users? Then, Newest Night Light is the best for you. It’s perfect not only for the child but also for adults. 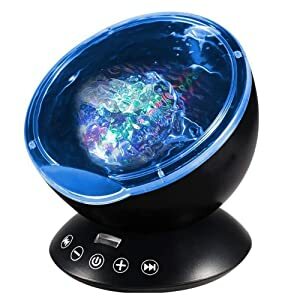 If a starry sky attracts you and you wish to have a private sky to gaze at whenever you like, then this night light with four different eye-catching display colors will provide you with a fascinating sky. And what for your child? The star-filled sky with multiple colors will help your kids to develop creativity and imagination. Besides, the noiseless rotator provides a quiet sleep environment for your kids. It features four operational buttons. It can either stay idle or rotate. 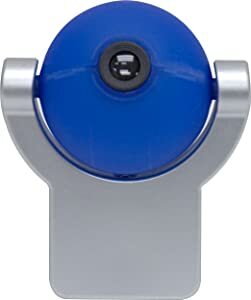 The rotator button helps to adjust various images on the ceilings and walls. Its time control mode allows you to set the turn-off time. It’ll shut down automatically by the time you set and helps your child to fall asleep quickly. It’s a versatile tool with glossy paint. You can use it for the birthday party, weddings, or other special events decoration to create a fascinating environment. Due to its nice looking you can also keep it on the bedside table, shelf or window sill. The added lanyard allows you to hang it on the kid’s tree house, your backyard or even your camping tent. Comes with different color selections white, red, green, blue and then several different combinations of those colors. Educational and nice looking design. Timer feature (automatic shut off). Only one downfall is that the batteries run out very quickly but it has a USB cord so you can use an adapter to plug it into the wall. Looking for an appealing night light for your child? 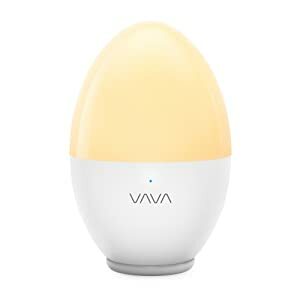 Then, regarding design, user-friendliness, safety features and illuminating power, VAVA Baby Nightlight can be an excellent choice for you. This light is cute egg-shaped and is made of plastic with a solid white base and clear white top. Your child will love this device to play with its expression stickers. It comes with 20 cute facial expression sticker that brings a sense of fun and creativity to your kids. Its touch-sensitive interface is almost magical that you’ll appreciate. Just touch the top to dim and double tap to turn off. To adjust the light color simply touch the logo. This LED lamp is not only energy efficient but also eye-caring that provides a very steady non-flickering glow. And the result is your child’s eyes (yours’ too) will remain strained-free. Also, it allows you to adjust the between warm white and cool white. It’s an all-night companion for your child. Once recharged, this light works up to 5 hours of use on max brightness and up to 80 hours on minimum brightness. What’s nice about this night light is it doesn’t need an outlet to run. It’s super portable and you can place it on different surfaces. Its waterproof feature makes it perfect for outdoor use. It’s an excellent accessory to take along on camping, hiking or any adventure trip. Comes with a USB port/plug in order to recharge the internal battery. Has two different color lighting options. Designed to learn and play with. No automatic turning off function. 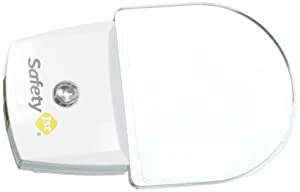 If you’re looking for the best nightlight for hallway or your child’s room, Safety 1st LED Nightlight with the automatic sensor is a safe way of providing soft light for your child’s room. Let’s take a look what more it offers. It’s easy to use. Just put the nightlight into an electrical socket. Being an auto sensor, it’ll automatically turn on when it’s dark and off when ample light reappears. It’s long lasting and economical. Due to LED lights, it lasts 25 times longer than any standard bulbs. And it also costs less to operate. The fire-resistance materials make the night light safe as well as sturdy. The package comes with two-night lights. You can use one of them in your baby’s room and the other in the hallway for your midnight trek to check in on your little baby. Perfect for home or travel. The sensor seems very sensible. If the room is even slightly dim, it turns on which may be uncomfortable for some users. Looking for the best night light projector to make your child’s room a calm and peaceful place? Then, the Projectables LED Night Light is a fantastic way to light up the room. So, how great is that? Let’s see. Tropical fish night light provides a soothing light to the entire room. Its LEDs and cool-to-touch globe design give the parents peace of mind. It also gives you the option to project the image on the floor, wall or ceiling which is a nice feature of this product. The images rotate for easy positioning on any surface. It projects images from Disney, Marvel, Nickelodeon and more. Your child will be fascinated by the six projectable images: moon, earth, planets, safari, fish, and seahorse. So, it will be an excellent way to teach your toddlers about fish and planets. It also features the light-sensing technology. That means you don’t need to be worried about to switch off the light. It’ll automatically turn on at dusk and off at dawn. Overall, this nightlight is a perfect one to provide enough light to make your child feel safe and peaceful. This nightlight can be aimed anywhere on the wall. Easy to change images by rotating dial. My only complaint is that after a while, the images start to fade a little. When it comes to buying a multifunctional nightlight that will create a relaxed environment for your child to fall asleep, this Cosmos projector night lighting lamp is the winner. The mystical light effect that looks like the night sky with moon and spangled stars provides a soothing and relaxing atmosphere. Your child (and you!) will enjoy the whole galaxy in your room and then a sweet dream. So, put the universe back to your home! Not only that, the STAR BEAUTY creates the most romantic atmosphere for dinner. Hence, a perfect projector for small gatherings or family events. The ABS material construction makes it not only durable but also safe for the child. Another unique feature that worth mention here is that it comes with both corded and battery options. So, you can easily plug in it into any standard outlet or use the battery if you’re on the go. Overall, a great night lamp to help put the kids to bed. The light comes with 5 different color options to choose from, you can also set it to mix some of the colors as well. It can rotate or it can remain stationary. Some users complain about the motor that when it spins it makes a slight noise. Are you all about quality and convenience? Looking for a feature-rich night light? If ”YES”, you might be interested in buying a multifunctional, handy projector. Ocean Wave remote control Projector with the built-in music player is a night-light that can meet your need. It’s not only a night light but also a perfect tool to create an ocean-atmosphere on your wall or ceiling. You can use it in living rooms, bathrooms, room decor or any other place to create a beautiful illusion. You have the option to choose from 12 LED and seven colors depending on your mood or surrounding. The adjustable 45-degree display angle is convenient to project the light point in an appointed direction. Touch sensor keys, dual- option and remote control features make this device more convenient for operation. This device features a built-in mini music player with four built-in music. If you still like to play your favorite music, the TF card slot will allow you to connect it with the external music source. So, play any song for your baby. And your little angel falls asleep and have a sweet dream all the night! Moreover, the music can be on without the light feature is on. Its built-in 1H, 2H, 4H allows the device to shut off automatically. You can control the whole settings with a remote, and I think it’s actually easier to do with the remote rather than using the buttons. The music built with 4 nature sounds (forest insect sounds, ocean wave sea gulls sounds, flowing water birds sounds and merry nature sounds.) already included. Made of heavy plastic and long-lasting. Buttons are not sensitive and it may make a loud sound when you press any of them. If what you’re looking for is safety along with cute designs to match your child’s room, Tecboss Chicken Night Light can be the best option for you. The 360-degree tumbler swing design and uniform non-flickering illumination bring your baby comfort. First of all, its user-friendly silicone and toy-grade ABS+PP material construction ensure 100% safe sleeping environment for your precious baby. 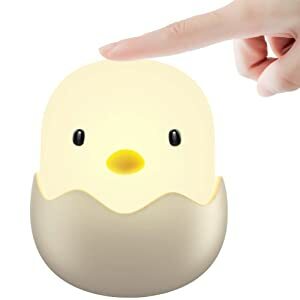 One of the most attractive and convenient features of this chicken night light is its easy touch control to turn on/ off and adjust the brightness dimmer to brighter. It’s also great as a nursery bedside lamp that gives enough soft light to check-ins your baby at night without waking your little one with harsh brightness. And it’s also worth to mention its best battery performance. Its built-in rechargeable battery works about 300 hours at lowest brightness, and 5-8 hours at the brightest light. Overall, an all-good cute nightlight! It collects dust pretty quickly. If your child cannot sleep without holding on to something, this friendly little owl nightlight will undoubtedly be pretty comforting for them. The lovely, cute look of this tool is just perfect to match the rest of your nursery. LED technology integration keeps it cool to the touch. Its easy-grasp handle is designed with little handles in mind. It will be perfect for those scary walks down the hall to the bathroom at night. You’ll also love its automatic turn-off feature. It automatically turn-off after 20 minutes. So, you don’t need to be worried about draining the batteries. Not only your child, but also you’ll love this best nightlight for nursing such as night-time check-ins, feedings or a diaper change. Overall, it’s one of the most affordable options from a trusted brand- Munchkin. The small and bottom located button is somewhat tricky for the toddler to push. You may need to replace the batteries every few months. Only one and unadjusted brightness. A lot of options in the market today will undoubtedly confuse you to make a wise buying decision. Thankfully, there are few features such as light brightness, product quality, ease of use, power source, price and as always safety that separates a good night light from a bad one. For you, we’ve made here a buying guide that will help you to judge whether or not the nightlight is the right one for your toddler (and for you!). Is the glow comfortable for the eyes? Brightness is one of the most critical aspects of a nightlight that you should emphasize. Sharp illumination will interfere with sleep, or your baby may play too long as he/she can see all his/ her toys in the light. So, go for nightlight with a soft and comforting glow that won’t prohibit your baby from having a good night’s sleep. Which power sourced night light is convenient? When selecting a nightlight also consider the power source. Battery operated and plug-in options are available. If the power outlet is reachable in your kid’s room, you may go for a plug-in night light. However, if the power outlet isn’t easy to reach, battery-powered light can be the best option for you. If you are looking for a portable option, consider the nightlight with USB chargers. Busy parents? Concerned about energy usage? If you need a nightlight for your baby’s nursing purpose, go for the model having the auto shutoff feature. Moreover, if you’re busy parents or concerned about energy usage, a nightlight having sensor will be useful. It’ll be automatically turned off when light reappears. So, you won’t need to be worried about to shut it off. How will you evaluate whether the nightlight is safe or not? Safety is a primary concern while choosing a baby product and the case isn’t different for the night light. Whether you want a corded or cordless version, you must consider the UL certification and other forms of safety certifications. Moreover, you should also evaluate the design and other added features whether these contribute to its overall safety. 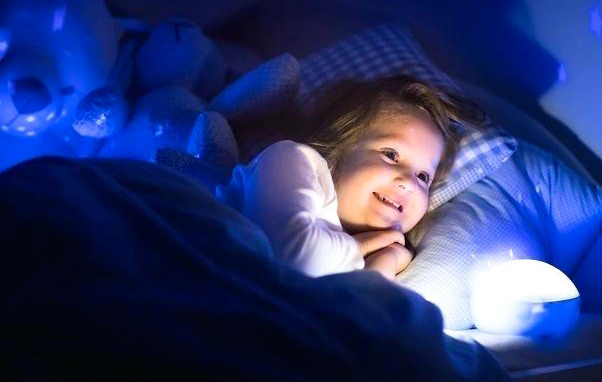 Nightlights create longer sleep intervals for your toddlers. And that’s not the only reason why they are so beneficial. We found 4 reasons that can justify a nightlight’s place in your home. Most doctors suggest that nightlights can play a significant role in your toddler’s brain development. 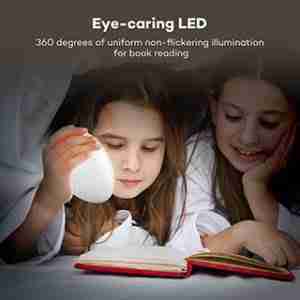 The nightlights emit eye soothing light that boosts visual development especially among toddlers aged 0-4 months. So, its recommended by the American Optometric Association. Children often have a fear of the dark. If you have a nightlight in their room, they can sleep feeling safer. So, nightlights promote sound sleep. Your kids would often go to the toilet at night. And keeping the room dark calls for unwanted injuries and falls. Nightlights emit a minimal amount of light that can help them find their way easily. And even for you when you are preparing the night time feed. Keeping the room dark or totally lighted can have diverse effects on your child. If you let your child sleep in lights, a hormone named Melatonin is secreted. And their sleep cycle will be disrupted. But nightlights can solve this all together. But keep in mind that you should avoid the ones which produce bright blue or white light. Use only the best nightlights for kids we recommended for best experience. The first thing to know is your children’s sleeping duration and natural time of waking up. Some children require 10-12 hours sleep, others might need less. So, depending on this you should maintain a routine for them. If your children have a short sleeping cycle, you can let them sleep late. But for children having a harder time waking up, should be sent earlier to bed. Your child should be mentally prepared before sleeping. So, that they can get the feel of going to bed. For this, you can maintain a series of activities like brushing, bathing, etc. to build up to that sweet silence moment. Fixing such a routine will help them get to bed at a certain time and wake up at the right time. With the current technology trend in progress, your children are more likely to spend a considerable amount of time in front of the screen. But you should take a step to limit the duration to an hour or two at max. If they love playing games on iPad or a smartphone, let them but only during the day. Certain foods can impact your children’s sleep positively or negatively. First, let’s talk about the positives first. Magnesium supplement like Natural Vitality Kids Natural Calm has calming effects that can help them sleep better. You can also give them cherries that has the formula to balance your kids’ waking and sleeping cycle. Let’s talk about the negatives now. You shouldn’t give them any food before bedtime especially candy bars and caffeinated drinks. Soothing lighting condition is critical for a sound sleep. Nightlight can be the best thing to use. Give yourself some time and buy one from our best nightlight for kids list. These lights can help them remain calm and boost their overall mental growth. But, aren’t you eager to know our recommendation? We know, you’re at the end of our review because you need one of the best night lights. Right? To speak the truth, when choosing a nightlight you should first consider your child’s choice, your need and overall your budget. 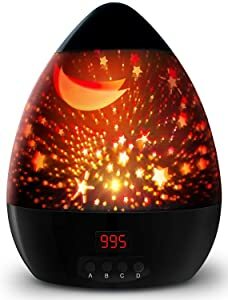 In our review of 10 best nightlight for toddler & kids, we’ve compiled the night light which is extraordinary regarding quality, safety, user-friendliness, and price. However, the ultimate winner of this final list is Cloud b Twilight Turtle Plush Nightlight Projector. It’s made with kid-friendly design, functional, educational & overall the best night light projector. And you’ll get it at less than half the cost of its main competitors. There’s no doubt that it’s the best night light for baby on the market today. So, help your child to forget the fear of the dark! Make your child’s bedtime enjoyable and calm! Pick the best and your favorite night light! You have twins & Now you want to look after your both baby at the same time? Then you mostly need a twins baby monitor. Hi, I’m Alvina Emmy, a full-time mother of two gorgeous kids and a part-time blogger. Being a single mum for the last 5 years has not only made me a stronger human being but has also fostered my emotional growth as an individual. I wasn’t a know-it-all from the beginning. I learned through mistakes. Parentloves.com is my humble attempt to lend a helping hand to all those new parents, soon-to-be parents and caregivers who want only the best for their kids. Hi, I’m Alvina Emmy, a full-time mother of two gorgeous kids and a part-time blogger. Parentloves.com is my humble attempt to lend a helping hand to all those new parents, soon-to-be parents and caregivers who want only the best for their kids.